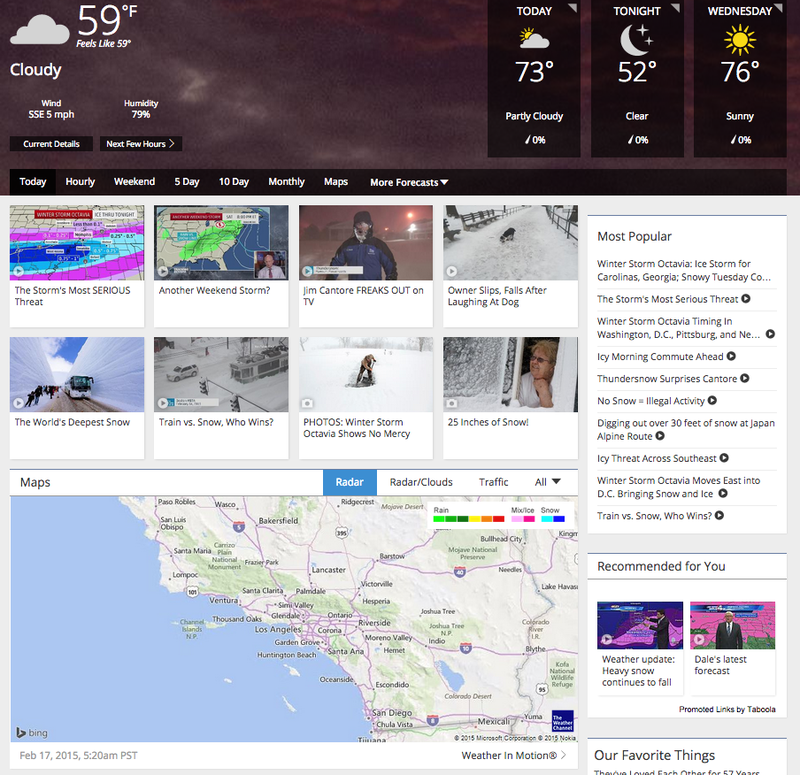 In November, 2014 Weather.com launched on Drupal, and became one of the highest trafficked websites in the world to utilize an open-source content management system. This was revolutionary because it further validated that enterprise companies with complex needs have a viable, more cost effective solution over closed-code, propretiarty options. We've put together a blog post series that will take a behind the scenes look at the migration. Our team of experts at Mediacurrent and Acquia will share best practices and what lessons we learned during this project. Last November, The Weather Channel launched their site on the Drupal framework, making it the highest-trafficked Drupal site in history. Mediacurrent, as the development firm that built the site, faced some unique technical challenges to ensure we not only met the requirements, but exceeded them wherever possible. There have been several presentations about the project, and a broad overview and case study were published around launch time, but little has been written about the details of how we approached their business requirements. In an effort to change that, we are beginning a blog series in which each entry will explore a different aspect of the project in detail. So keep an eye out for more entries like this one in the coming months, and if you are curious about a specific aspect of the project, be sure to comment here and maybe we can address it in a later post. For this first entry, we will explore part of the custom built solution we call the “Presentation Framework”. TWC needs to allow a (non-technical) content team to rapidly modify content and layout of pages throughout the site. Given the numerous types and rapidly changing nature of the content widgets required, we wanted to involve TWC’s own talented team of developers as much as possible in the implementation of the logic driving them. In architecting this framework, several requirements had to be considered and balanced. As you see in the above image, a typical page on the site is comprised of many sections or widgets, each of which has its own needs in terms of cacheability, configurability, and individualization. Our system needed to be be powerful enough to alter presentation based on the target device, or offload processing to the client side for delivering content where appropriate. * Utility function to generate the pane configs. // No reason to generate repeatedly, so (static) caching results. // Get all of the module metadata from the AngularJS path. // Loop through the found modules and create panes for each. // Create the pane config. // Loop through required contexts, if any. // Add the context requirement to the pane metadata. * Utility function to get all AngularJS module metadata. *   Array of metadata objects found or object if specific module requested. // Collect all folders that contain plugins. // For each directory, add to the collection of plugins. // Add the angular app to the modules array for later return. // fopen and json_decode our file. // Validate and extend the theme data. // If no label, try setting a default. // Cache the data so that we don't have to build it again. Why a Panels content type? This allows their developers to create new widgets, which their site managers can then add to their layouts using the highly customizable drag-and-drop panels interface into the various pages throughout the site. It means that widgets can be re-used as many times and in as many different places as needed, while their internal logic could remain independent, versioned and exportable. This also means that instead of having to manage different types of widgets from different places, the custom JSON / Angular widgets could be added in exactly the same way as a dynamic Drupal block, for instance, or even just a static piece of HTML content. As of this writing, TWC developers have written over 200 such widgets! Additionally there are even more shared libraries, directives and supporting code using the platform as modules. That about wraps up our first peek behind the curtain of what has been a landmark project for Mediacurrent, and for the wider Drupal world. Many thanks to project lead Jason Smith (the presentation framework is his brainchild) and the rest of Mediacurrent’s weather.com team, and of course to you our readers. Stay tunded for additional posts in our blog series about the Weather.com launch!